The words are a bit cryptic but I assume they mean you can't use the screw connections for A4 if you have plugged the uncoupler into the A4 uncoupler socket, and don't dim the output to A4 (CV 112 controls A3 and A4 in this respect if you have a newer XLS). You have connected one uncoupler (the "A4" one) to the provided socket on the upper side of the XLS decoder, yes? How have you connected the "A3" uncoupler? When you tried them on the bench, how were they connected? To the same decoder? The only problem I had with uncouplers was not enough track voltage, 19v was not enough to trigger them consistently, 21v was. EDIT: FYI you can connect both uncouplers to the same output if you want. You can get a "splitter" cable for this. Well, it means use either the socket or the screw connection, because they are in parallel. In the socket there are also DEC+ and DEC- . If you use FA4 for a simple lamp or LED, you can connect it either to the socket, using DEC+ and the FA4 pin (DEC- is not used), OR connect to the screw conector and use DEC+ also from there. You may dimm it to the Lamp-voltage you need. uncouplers allways need full voltage, as Dave stated. The actual series is much more stable. make sure you use parallel-mode for DCC, not serial ! otherwise it will blink ! No offense, but are you measuring the function output referenced to the common (usually blue)? Also did you measure with nothing connected? How new is your XLS decoder? - This, and the software revision, may have a bearing on things. I would have thought 24v (DC?) to central station would be enough. On my system there is about 3v drop once it has been though the central station and decoder etc. In other words the max DC voltage presented by the decoder is about 3v less than input to the central station. As Greg Elmassian and PhilP said make sure you measure your voltage to A4 using the correct pins. Your post #4 says you were measuring voltage. So, I was assuming you were testing the voltage applied to the uncoupler. you fixed on "usually blue", but you did not figure out "common".... there is always a common for function outputs. This is normally plus... but it will be called "common", or it should be if anyone is following any standards at all. I would question what the output of the wired function is. I know what a Zimo decoder does and has this issue. To reduce the voltage on a function key on a Zimo decoder the decoder used timed pulses. the lower the voltage, the shorter the pulse for on time. LGB has function keys paired for voltage adjustment on their decoders and I assume they do pulse output for control also. The massoth uncoupler just takes full track voltage, no need for pulse output or servo settings, all that is done in the circuitry inside the uncoupler. 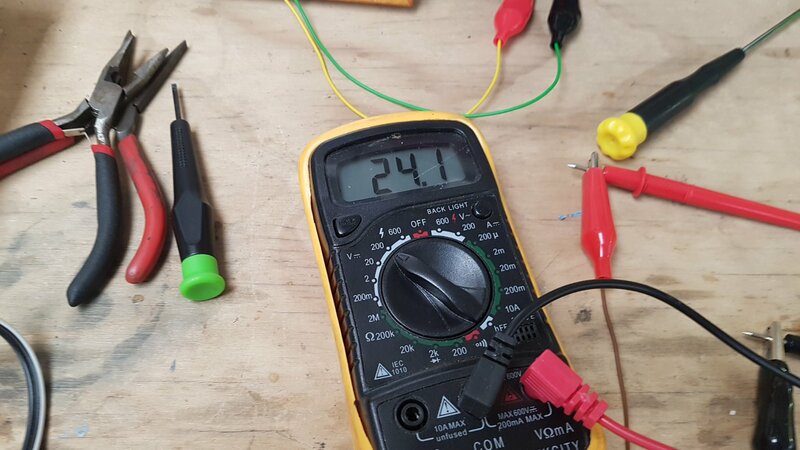 Tested the voltage on A4 as suggested found that to be too high 28v measured on the multimeter DC . There seems be no voltage drop from what goes into the Central Station and what comes out of the A4 function in fact the voltage rises . 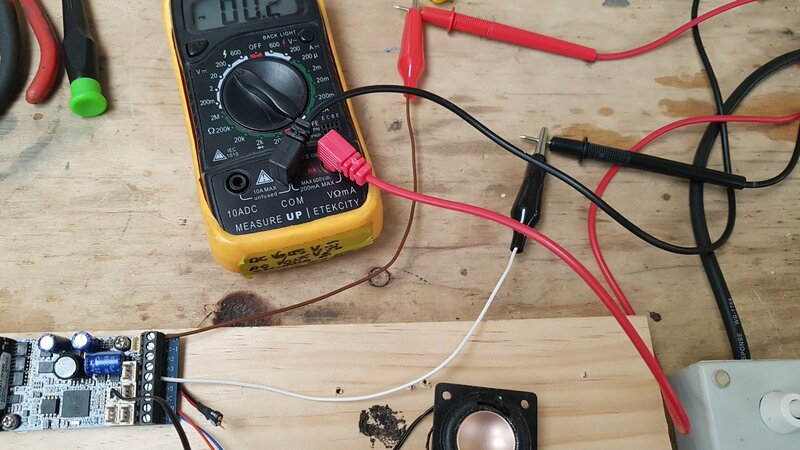 I am using a 5 amp Regulatated power supply for my Power sourse . I have reduced the voltage input on the Power supply to 20.5 the lowest I can put it down to. 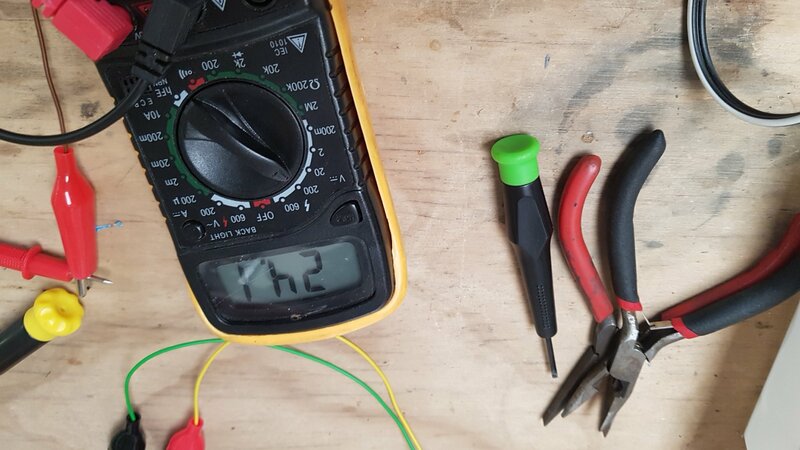 The multimeter still reads higher at A4 than at the input to the Central Station. The manual for the Uncoupler shows a voltage of 16-22 DCV required to operate the Uncoupler . The manual for the Decoder shows Setting CV112 to 32 gives full track voltage 24v can this CV be changed to a lower voltage . I have attached some photos to show how I am testing the A4 function . Also I hope the Uncoupler has some protection for over voltage . The meter shows 24.1 volts... so is the 28v referenced above a mistake? At low current (like the minute current of a volt meter) it will basically be rectified track voltage. it's impossible that the +DEC is higher than the track voltage rectified, and I'm pretty sure never higher than the input DC voltage. In any case, what voltage do you think the uncoupler wants? 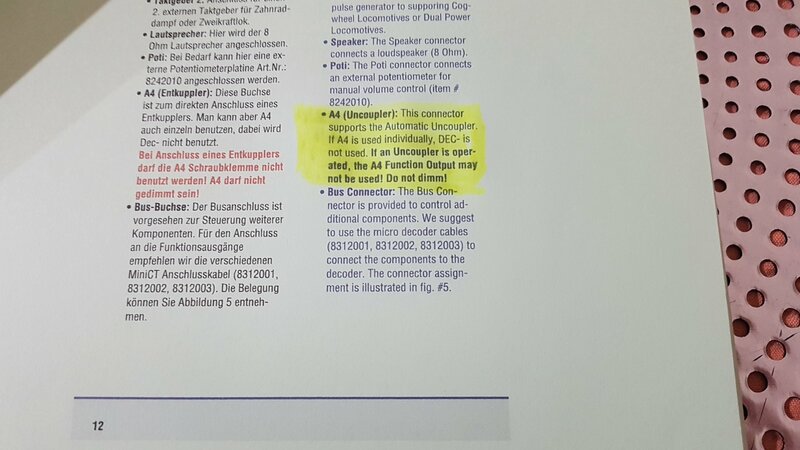 The uncoupler manual specifies the connection. There are 3 wires from the uncoupler... one goes to DEC+, one goes to ground GND and the last goes to A4.... voltage on this line DOES NOT MATTER, all I was after was the voltage goes on and off with the function key to toggle A4. Hi Greg . 28DCv was what I measured when I first checked the A4 Output before I lowered the Input Voltage. The input voltage now shows 20.2 voltes . The 28DCV was what the A4 showed when I first connected the Multimeter before I lowered the Input voltage . Input voltage is now 20.5 Voltes . Can I Change the CV to get the 22DCV required for the Uncoupler, it does say in the manual not to Dim the Function Outlet , I can not lower the input voltage any further . Also I am sure I have hooked up the wiring right Red to DC+ Black to DC- Brown to A4 function outlet . I have not removed the Uncouplers from the loco yet bit of job to do that . I did bench test the Uncouplers before I installed them and after installation and they did work although intermittently . I did notice a Post that stated that stated the volatage was raised to make the Function Button work , that is why I raised the voltage thinking that was the reason for the Button working intermittently . I have changed all lights to LED and they are all working full track voltage using Resistors . Thanks for your help Greg it is much Appreciated. Measuring the voltage between A4 and Dec+, the A4 Output is PWM, unless a PWM to Linear converter is used to measure the output, the accuracy of the reading from A4 output will always be flawed, and should not be relied upon for any basis of a calculation for determining the CV value for voltage for a output. What it should prove though, is, if the Function Button allocated to A4 is turned ON, a voltage reading of some sort will be present, likewise when the Button is turned OFF none or little voltage should be present. To determine the ACTUAL voltage present, and at what level volt's are available, measure between Dec + and Dec - (+22, GND), as long as it's in the range of 16 to 22V, sufficient is available to power the uncoupler. The A4 Output* has to be set to 32 (Full Track Power), no other device should be connected to this output if using the uncoupler. Uncoupler itself, assume the instructions were followed to letter for the installation, with particular reference to the band. Not sure of the age of these uncouplers, there were a few knocking around some while ago that point blank refused to work, ultimately the only course of action is to send them back to either Massoth or from whom they were purchased. * Can be connected to a switching output, (free open collector function output) that has mA rating of 50 mA or more. ** Not a job for the faint hearted, the uncoupler can be disassembled and reassembled, has been occasionally known for the "nut" on the motor screw shaft to go AWOL, particularly if short cuts were used or taken during the install procedure! Seem to recall from a previous query, about the manual and which decoder? John, if the decoder output is set to full (A4), my understanding there is no PWM, since it is full on when enabled. A4 function dose work get a response with a push of the Button . Really appreciate your help will test Dec+ and Dec- in the morning . Supplied for comparison and information. There is a value, for the OFF voltage that is still present when the output is turned off, (between 0.02V and 0.06V refer to post 17) hence the requirement for the use of a resistor when connecting a device, for example a transistor to the output, the residue voltage absorbed by the resistor ensures that the output is OFF. In Massoth speak PWM refers to Dimming value. The ability to accurately measure the PWM on the Output A1 is dependant on the quality and the accuracy of the equipment used, whist the PWM output is fairly stable when using the Massoth 1201Z, not a hope in hell of any accuracy without a fairly sophisticated Digital Multimeter as the PWM output of the XL A1 swings about like paper bag in the wind when the source is the PIKO 35010. The processor at the heart of an XL Decoder has 3 PWM outputs, 2 are located on timer/counter1 (16bit) and 1 is located on timer/counter2 (8bit). Consisting of 23 Programmable I/O Lines, defined as either PORTB, PORTC and PORTD. PWM can be simulated in software, however the hardware version is preferred because, it just sort of does its own thing and, with very little coding you can get a constant square wave going. Timer/Counter2 is also capable of running in two modes, Fast PWM mode and Phase Corrected PWM mode. Both of these modes can be inverted or non-inverted. Due to the high frequency of this mode, it is best used for LEDs. This mode is recommended for motor control.